Brooklyn Bridge Park (BBP) today announced plans to build a permanent pool at Squibb Park, which sits just above Pier 1 in Brooklyn Bridge Park and is connected to the Park through Squibb Park Bridge. Subject to necessary approvals, NYC Parks intends to enter into an agreement with BBP for the development, operation, and maintenance of a pool and optional related amenities at Squibb Park. BBP President Eric Landau was joined by Deputy Mayor and BBP Board Chair Alicia Glen, NYC Parks Commissioner Mitchell Silver, Brooklyn Borough President Eric Adams, Assembly Member Jo Anne Simon, State Senator Brian Kavanagh, Council Member Stephen Levin, Brooklyn Bridge Park Conservancy Executive Director Nancy Webster, and Love Our Pool. The construction of a pool at Squibb Park is estimated to cost between $10-$15 million. One-third of the capital funding for the project will be funded by BBP; and the remainder will be raised publicly and privately in partnership with the Brooklyn Bridge Park Conservancy. Midtown Equities and Alloy Development with Monadnock Construction, and DLJ Real Estate Capital Partners are also supporting the effort and have already dedicated funds towards the pool. A capital fundraising campaign is now underway to ensure the needed funds will be raised. Brooklyn Bridge Park will host community planning sessions this summer and fall as the fundraising campaign continues, in advance of issuing a Request for Design Proposals. As the Park moves forward in the design, planning process, and fundraising campaign, the specific project timeline will be announced. 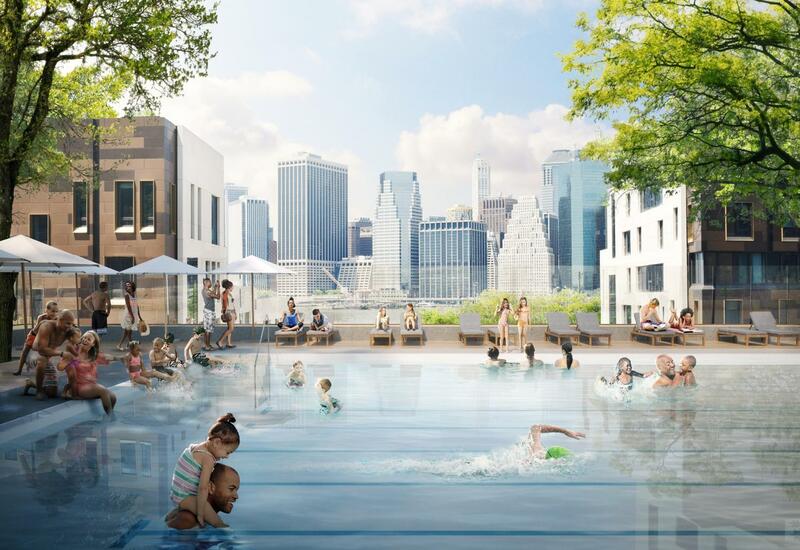 “An all-new permanent pool at Squibb Park will mean more fun in the sun in Brooklyn, and it demonstrates Brooklyn Bridge Park’s commitment to provide more access to world-class amenities for all New Yorkers.” Mayor Bill de Blasio. “Brooklyn Bridge Park has been one of the great New York success stories - and the forthcoming addition of a permanent swimming pool means it’s only getting better,” said Deputy Mayor Alicia Glen. “I am thrilled that the Brooklyn Bridge Park Corporation is making the beloved pop-up pool a permanent feature in the park. Everyone loves the pop-up pool we have now. With few local swimming options, having a permanent pool in Squibb Park will make parents, children, and other visitors very happy! I am also very pleased that there will be a robust community engagement process, so our new, permanent pool will best serve communities’ needs. Thank you to the Mayor’s office, Brooklyn Bridge Park Corporation, Love Our Pool, my fellow legislators, and everyone who worked tirelessly to make this happen. I can’t wait to get started,” said Assemblymember Jo Anne Simon. “Empire Stores is thrilled to be supporting Brooklyn Bridge Park’s exciting improvement project. Having a permanent pool in Squibb Park will bring an amazing public amenity to the community, which we’re honored to support,” said Jack Cayre, principal at Midtown Equities. The pool at Squibb Park will provide a permanent area dedicated to swimming for the surrounding communities and beyond. Since 2012, Brooklyn Bridge Park has operated a temporary pop-up pool at the site of the future Pier 2 uplands. Construction of the Pier 2 uplands is expected to begin in the fall of 2018, making the summer of 2018 the final season of the pop-up pool.